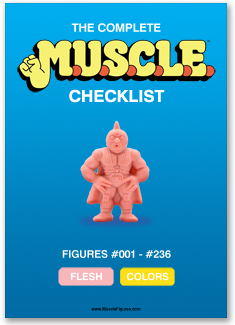 Download our free M.U.S.C.L.E. Figure Checklists! Quality, full colour A4 Checklists to help you keep track of all your figures! Available in two versions – a first generation all-flesh checklist (for the true purist!) plus a checklist for all 236 figures and each of the colours they were released in. Print them off and easily keep track of which figures you need to complete that Master Set!